The Madonna and Child with St. Anne (Dei Palafrenieri) is one of the mature religious work of the Italian Baroque master Caravaggio, painted in 1605-1606 for an altar of the papal grooms (palafrenieri). 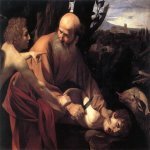 The painting was briefly exhibited in the parish church for the Vatican, the church of Sant'Anna dei Palafrenieri on the Via di Porta Angelica in Borgo, near the Vatican. 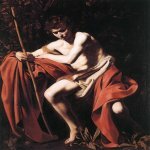 It was subsequently sold to Cardinal Scipione Borghese, and now hangs in his palazzo (Galleria Borghese), it shares space along with five other Caravaggios: Boy with a Basket of Fruit, David with the Head of Goliath (attributed to 1606), Young Sick Bacchus, Saint Jerome Writing, and St John the Baptist in the Desert. While not his most successful arrangement, it is an atypical representation of the Virgin for its time, and must have been shocking to some contemporary viewers. The allegory, at its core, is simple. 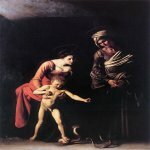 The Virgin with the aid of her son, whom she holds, tramples on a serpent, the emblem of evil or original sin. Saint Anne, whom the painting is intended to honor, is a wrinkled old grandmother, witnessing the event. Flimsy halos crown the upright; the snake recoils in anti-halos. Both Mary and Jesus are barefoot; Jesus is a fully naked uncircumcised child. All else is mainly shadow, and the figures gain monumentality in the light. If this painting was meant to honor the grandmother of Christ, it is unclear how the ungracious depiction of her wrinkled visage in this painting would have been seen as reverent or iconic. Further shock must have accrued, as stated by Bellori, at the Virgin Mary’s revealing bodice. Finally, one could attempt to assume that the parallel diagonals of Jesus’ phallus and his leg, suggest that both battle the snake, with one its metaphorical equal.